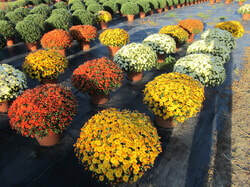 Chateau Farms has over 90 different varieties of Fall Mums and Asters. There are many different colors and flowering dates to choose from. 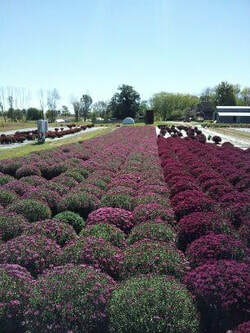 All of our mums are grown outside in the elements and are weather hardened. We also have them hooked up to a water system that allows us to control the water and fertilizer flow to each pot. This allows us to give each individual plant the TLC they desire. 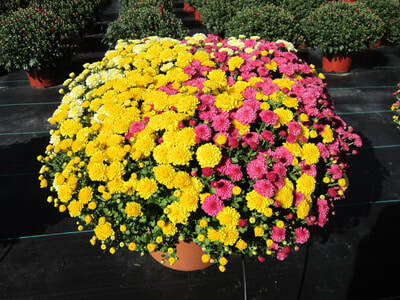 We offer both Mums and Asters in 9" pots and also have a variety of colors in 12" pots and 10" hanging baskets. 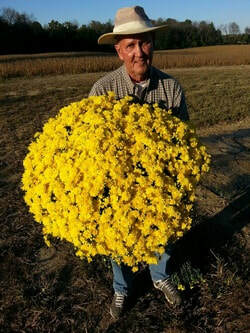 If you need one mum or a thousand, we can fulfill your needs! Contact us to allow us to help you color your fall landscape. What's the Difference Between a Fall Mum and Aster? 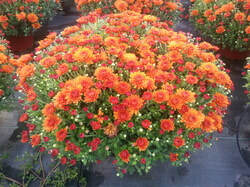 Mums come in a wide variety of great colors and forms. There are different shades of orange, red, yellow, pink, purple, and white. Asters don't come in as many forms and colors as mums, but provide a bright splash of color. 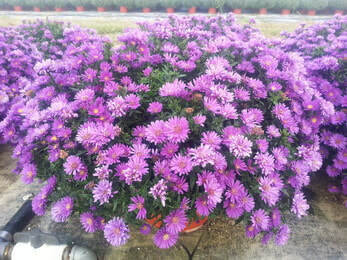 Asters come in purple, magenta, blue, pink, and white and have large and small blooms. For a nicely-shaped mum in the fall that has the maximum number of blooms, continual pinching back of the growth tips until the 4th of July is recommended, while asters don't really need this. You can pinch them back a couple of times if you want to though, for a bushier plant come fall. The mums and asters offered at Chateau Farms are considered hardy (perennials) and while the mum's root will go dormant in the winter, the aster will re-seed itself next Spring. 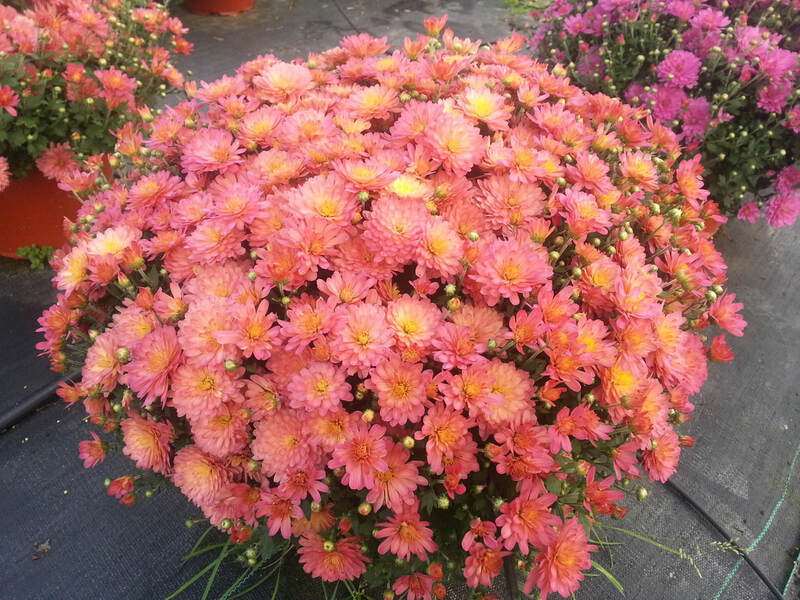 How to care for your Fall Mum and/or Aster. Location. Choose a spot that gets at least six hours of sun a day. Plants that don't get enough sunlight will be tall and leggy and produce fewer, smaller flowers. Soil preparation. Mums thrive in well-drained soil. Heavy clay soil should be amended. If your yard is soggy after the slightest rain, grow mums in raised beds with friable soil for good root growth. If the soil is too dense, add compost and prepare to a depth of 8-12 inches for best performance. Mums' roots are shallow, and they don't like competition. Plant mums about 1 inch deeper than they were in the nursery pot, being careful with the roots as you spread them. Trim off the previous year's stems as soon as the new spring growth begins to show. Fertilizer. Plants set out in spring should get a 5-10-10 fertilizer once or twice a month until cooler weather sets in. Don't fertilize plants set out in fall as annuals, but plants you hope to overwinter should get high-phosphorus fertilizer to stimulate root growth. The key to those full, rounded domes of blooms that you associate with mums is pinching to create more branching and keep plants compact. Don't hold back -- just a few minutes here and there will reward you with a thick, solid-looking plant. If you've bought large, full plants in the fall, they have already been pinched and are ready for planting. Young spring plants will need pinching for maximum bloom and best plant shape.